Flush from solving the mystery of the dying Olde Oak, the party rested overnight and visited commander MacMillan the next morning. They were glad to learn the rogue Holtz was still in custody, so they inquired about rumors of a Goblin camp outside of town. The Commander told them that a small group of Goblins have been raiding Dwarven trade caravans, and have been even approaching the gates of Larm as of late. Patrols had recently discovered the Goblin encampment 3 miles to the northeast of town, off of the trade road. He offered a reward of 50 gold each if the Goblins were slain and the camp razed. A village guard led the party along the trade road, to a point where a small path left the road to the south. The path, he said, led to the Goblin camp. He wished the party luck and returned to Larm, unwilling to assist. After some discussion, the party agreed the best course of action was to scout ahead and see what they were up against. Ruby obliged, leaving the path but following it several hundred yards to a large, circular clearing, surrounded by dense forest and undergrowth. Ruby spied two Goblin guards standing in front of an opening in a palisade fence, itself made of wooden timbers and perhaps 10 feet tall and 15 feet across. The opening was just wide enough for two Goblins to walk abreast, but Ruby saw no gate. Ruby headed back to inform her companions of the situation. They proceeded down the path, but stopped before they were within eyesight of the Goblin guards. Ruby scouted more of the encampment, discovering it was indeed a circle, about 200 feet across at its widest and surrounded mainly by dense forest, with another small section of palisade fence to the south. Within the camp, Ruby could see three tents, several Goblins milling about, and two wolves. Arsenios devised a plan of attack – the party would approach the main entrance, surprising the guards and hopefully creating a diversion, allowing Ruby to proceed undetected into the camp through the line of trees to the west. Ruby proceeded south as quietly as her Halfling feet allowed, while the party confronted the guards, arrows ready. As Ruby was approaching the camp and making her way through the thick underbrush on the camp’s west side. She heard a ‘crack’ as her foot broke a stick, and the wolf inside the camp growled and approached the tree-line. Meanwhile, at the camp entrance, Melian and Dai had surprised the guards and loosed a volley of arrows. One guard escaped behind the palisade wall and into the camp, while the other was impaled and stuck to the wall by a well-paced arrow from Dai. The party heard a bell, then saw a large bonfire erupt, just inside the palisade opening! Arrows started to fly out through the open palisade from within the camp, and the party took cover. Ruby saw Goblins converge in the center of the camp, around the fire-pit – eight in all, with bows and swords. Thankfully, the wolf who had been approaching Ruby turned and joined the Goblins, along with one other wolf who had come from the far side of the camp. Ruby moved in behind the Goblin group and lit a tent on fire, then quickly ran back into the woods. Two Goblins broke off from the main group around the fire-pit and moved south, searching for the troublemaker. At the front of the camp, Arsenios sought to catch fire to the inside of the palisade wall itself, first by dousing it in oil, then setting it alight with a torch. Arsenios and Dai carefully tried to do so, staying concealed as much as possible from both the arrows and intense heat of the bonfire, even so Dai caught an arrow in the arm for his troubles, dropping his torch in the dirt. The party waited for the bonfire to die down a bit, then started in on the Goblins with their own arrows and sling stones. It was difficult firing through the opening, but even still several Goblins were wounded by lucky shots. Ruby, now in hiding in the underbrush just south of the camp, took aim on one of the searching Goblins with her bow and felled it with an arrow to the throat, revealing her position. 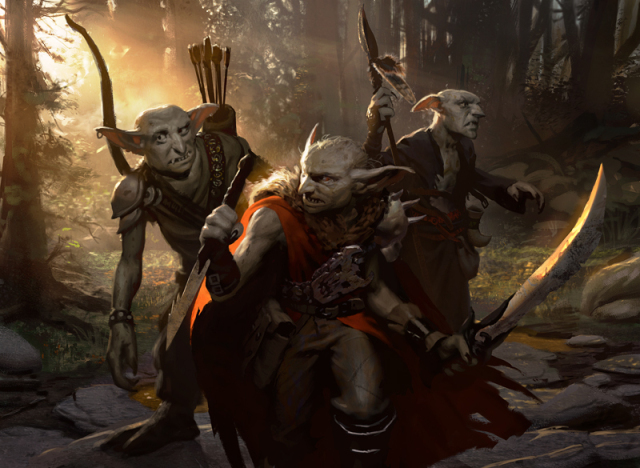 However, the remaining Goblin, having just seen his companion fall, was in no mood for a similar fate, and ran back to the center of the camp for reinforcements. By this time, the fire had died down enough that Goblins and the two wolves were rushing the entrance. Melian stood in front of them, uttering a sleep enchantment that put three of the Goblins out of commission. The two wolves were unaffected, however, and charged through the palisade. Adrog confronted one, killing it but gaining a painful wolf bite in the process. The other fell to Dai’s sword. Ruby was forgotten as the remaining three Goblins were sent through the opening, swords drawn. Only one Goblin stayed in the camp, Arsenios surmised he was the Goblin leader, as he was ordering his troops to attack. In a pitched battle the party emerged victorious, but at great cost – Melian was slain by a Goblin blade. As the party ran through the opening towards the remaining Goblin, he backed away from them, unsure of what to do with his entire camp gone. As luck would have it, the Goblin leader was headed towards Ruby’s hiding place. She rose and quickly fired an arrow, striking him in the back but only serving to anger him. He growled, turned, and gave chase. Ruby headed out of the dense underbrush and ran north, back towards the entrance, but when she arrived, the party had already proceeded into the camp. She saw Melian’s body and was for an instant stunned – then, spying the party yelled to them and ran into the camp. The Goblin leader followed, his rage getting the best of him. Together, Dai, Arsenios and Adrog made short work of him and at last, the battle was done and Melian’s death avenged. Dai and Adrog quickly dispatched the three sleeping Goblins, while Arsenios and Ruby searched the camp. They found scattered gold and silver coins on the Goblin bodies, and a large chest which when smashed open contained a large quantity of gold, a wand, and an old, hemp rope. Together the party returned to Larm with Melian’s body in tow, not at all in a celebratory mood.